Elasticity (hardness) is a mechanical tissue characteristic that prevents tissue displacement under pressure. It varies in different types of tissue (fat, collagen and so forth) and in the same tissue in different pathologic states (inflammatory, malignant). During the past few years, sonographic elastography, magnetic resonance elastography and some other techniques have performed digital measurements of tissue hardness. In sonographic elastography, image representation of tissue hardness can be obtained using a conventional sonography machine with special software and a conventional ultrasound probe. , In brief, sonographic elastography works in the following steps: First, elastography receives digitized radiofrequency echo lines from the tissue; second, it gives slight compression to the tissue by the transducer along the radiation axis to make some displacement; and third, it receives a second, post compression digitized radiofrequency echo line from the same tissue. Then the data from these two echo lines undergo processing, and ultimately an elastographic image (elastogram) appears on the monitor. Increasing tissue hardness appears in ascending order as red, yellow, green and blue. These colors represent the relative hardness of the tissues in the elastogram. The purpose of this study was to investigate the accuracy of conventional sonography, sonographic elastography and their combined evaluation for the differentiation between benign and malignant LN enlargement. This prospective study included 88 patients referred for either thyroid sonography and elastography where cervical LNs were examined as a part of neck examination or referred for endoscopic ultrasound assessment of pancreatic and gastrointestinal masses where regional and second station LNs were examined and biopsied as a part of staging of the masses. Patients referred for endoscopic ultrasound assessment of pancreatic and gastrointestinal masses, regional and second station LNs were examined and biopsied as a part of staging of the masses. Final diagnosis was not settled as in patients with no definite histopathological diagnosis or patients dropping out of follow-up. In all patients, ultrasound or endosonography was done upon request of their consulting physicians. For confidentiality, their names were omitted and replaced by numerical codes. Elastography score. The most common technique used in ultrasound elastography is to apply external pressure using the transducer. After placing a linear transducer over the region of interest, the ultrasonographer manually applies light pressure with the transducer. For Endoscopic ultrasound (EUS) examinations, the pulsations of nearby major vessels were exerting compression on the intra-abdominal adenopathy. The ultrasonography (US) elastogram was displayed over the B-mode image in a color scale that ranges from red, for components with greatest elastic strain (i.e., softest components), to blue for those with no strain (i.e., hardest components). The US elastographic image was matched with an elasticity color scale present on the side of each image. Pattern 1: 80% or more of the cross-sectional area of the LN is red or green, i.e., soft. Pattern 2: 50% or more and less than 80% is red or green. Portahepatis (4.5%), and 6 upper para-aortic (6.8%). All US or EUS elastographic examination was done by a single Gastroenterologist. Ultrasound elastography was done using Hitachi color machine type EUB-7000, with a 10 MHz linear transducer; Hitachi Medical Systems, Tokyo, Japan. Endosonography was done using Pentax; machine, EUS EG3830UT connected to a Hitachi sonographic machine EUB-7000. FNAC specimens were obtained under ultrasound or EUS guidance, smears were wet fixed in 95% ethyl alcohol and stained with hematoxylin and eosin stain for routine cytologic evaluation. Biopsies were taken either by excision of LNs or using a tru-cut needle biopsy according to circumstances. Follow-up in benign lesions not indicated for biopsy for at least 12 months. Sensitivity, specificity, positive predictive value (PPV) and negative predictive value (NPV) were calculated. Receiver operating characteristic-curve was applied, calculating the area under the curve (AUC), sensitivity and specificity for the tests used. Cut-off values were calculated. Univariate prediction model were performed for calculating predicted probabilities and data were graphically represented. P value was considered to be significant if less than 0.05. Most of the cervical LNs had sonographic criteria suggestive of benign nature and had elastography score of 1 and so biopsy was not indicated and their diagnoses were based on follow-up with the minimum period of 12 months. Suspicious LNs (perigastric, peripancareatic, celiac, pararectal, mediastinal, portahepatis and upper paraaortic) in patients with malignant masses referred for endosonography were diagnosed based on FNAC from the following LNs groups (perigastric, peripancareatic, celiac, pararectal, mediastinal, portahepatis, upper paraaortic). There was only one case with celiac lymphadenopathy in which sonographic criteria was suggestive of benign nature so the diagnosis was based also on follow-up and finally the patient had definite diagnosis of acute pancreatitis. Only one case with axillary LNs was included for a patient with breast adenocarcinoma and it was diagnosed as metastasis based on sonar guided tru-cut biopsy and it had elastography score of 2. In LNs with score 2, if clinical or sonographic suspicion existed the LN was subjected to histopathological examination, but in case of low suspicion the follow-up policy was adopted to avoid unnecessary invasive procedures. All LNs with score 3 and 4 were subjected to histopathological examination either by biopsy or FNAC. The classification of LNs according to the character was as follows: 59 were benign, 25 metastatic and 4 were diagnosed as lymphoma and the diagnosis was made by biopsy in 17 cases (7 excisional and 10 tru-cut), FNAC in 20 cases and follow-up for at least 12 months in 51 LNs all proved to be benign [Table 1]. Fortunately enough all histopathological diagnosis based only on FNAC (due to technical feasibility) were positive for malignancy so there was no need for further invasive techniques as excisional or tru-cut biopsy. Regarding the echogenicity, 98.3% of the benign LNs were hyperechoic while the rest were hypoechoic, and 89.7% of the malignant LNs were hypoechoic, 3.4% heterogenous and 6.9% hyperechoic. Patients' number is different. The mean transverse diameter was much larger in metastatic LNs and so was the longest diameter, there is also a significant positive relation between the transverse diameter and elastography score i.e., the larger the transverse diameter the higher the elastography score. Results of L/T ratio analysis were as follows: AUC = 0.846, P = 0.00, cut-off = 1.93, sensitivity = 73%, specificity = 100%. 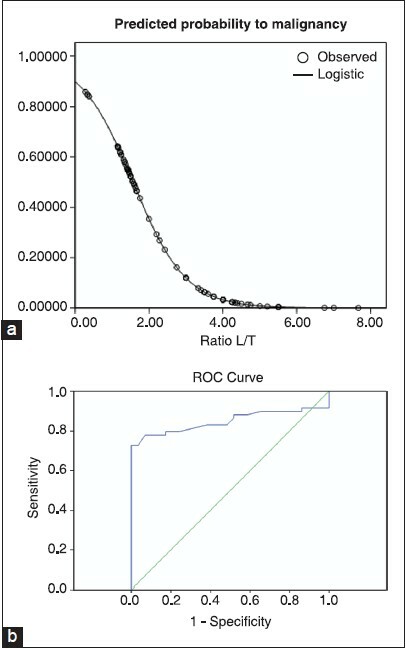 Decreased L/T ratio is associated with increased probability of malignancy [Table 2] and [Figure 1]. All cases with score 1 proved to be benign with specificity of 100%, sensitivity of 76.3%, PPV of 100%, NPV of 84.7%, meaning that none of the LNs with score 1 were malignant, so score 1 can be an excellent excluding factor for malignancy [Figure 2]a. The statistical parameters of score 2 in detecting benign lesions and the specificity for score 3 in detecting malignancy were shown in [Table 3]. All LNs with score 4 were malignant with specificity of 100%, PPV 100%, sensitivity 85.5% and NPV 65.5% [Table 4], [Figure 2]b and c.
Some previous studies grouped the elastography groups into categories, so they combined scores 1 and 2 and also scores 3 and 4. Further analysis to our results revealed that the elastography grouping into scores 1 + 2 then 3 + 4 in differentiating between benign and malignant revealed sensitivity of 79.3%, specificity: 100%, PPV: 100% and NPV: 90.8%. When score 3 + 4 is related to metastatic LNs, only sensitivity becomes 100%, with specificity 95.16%, PPV 88%, NPV 100%. The pathological changes resulting in the enlarged LNs include reactive hyperplasia, lymphoma and tumor metastasis. The findings of B-mode and power Doppler sonography usually overlap and could not accurately reflect the nature of the LNs. Therefore, much more information should be provided to differentiate benign from malignant LNs. The elasticity or stiffness of the tissues is closely related to the biological characteristics. According to this theory, palpation is regarded as valuable for diagnosis in clinical practice. However, the palpation results vary with the experience of the examiners. Palpation has less sensitivity than US for detecting enlarged LNs in patients who have suspected regional LN metastases. Elastography is a new technique with a very high specificity for malignant LNs at score 4 where it had specificity at our study of 100%. In our study, we found that E-score 1 can be a good excluding factor of malignancy so only follow-up is warranted in such cases and E-score of 4 is specific for malignancy and histopathological examination is a must to detect the type of malignancy. Furukawa et al. carried out a study on the LNs and classified the elastographic findings into 4 patterns. Their results revealed that the metastatic LNs were rated as patterns 3 and 4 and the benign ones as patterns 1 and 2. This was similar to our study where most of the benign nodes were classified as score 1 and 2 and most of the malignant ones were classified as score 3 and 4. According to our results, E-score 3 and 4 has a specificity of 95.16% and sensitivity of 100%, PPV of 88%, NPV of 100% for metastatic LNs. Rubaltelli et al. found score 3 and 4 together 75% sensitive, 80% specific with PPV 80%, NPV 70%, unlike Chaoi et al. at 2011 who found E-score 2 and 3 had a sensitivity of 80.7% and a specificity of 66.7%. This sensitivity dropped to 29% while specificity became 97% in E-score 3 and 4. The number of LNs in this study diagnosed as non-Hodgkin's lymphoma (NHL) was only 4, so no significant results could be deduced, however it is worth mentioning that 3 of them had E-score of 3 and one only had a score of 4 suggesting that LNs of NHL might be slightly softer than metastatic LNs. Metastatic LNs are predominantly hypoechoic when compared to the adjacent soft-tissues except for metastatic nodes from papillary carcinoma of the thyroid, which are commonly hyperechoic. This agrees with our results in which nearly 90% of the malignant LNs were hypoechoic. Elastography is a promising modality that may complement standard B-mode ultrasound and EUS and help guide FNAC and biopsy during staging of LNs. It is easy, rather cheap, non-invasive and repeatable and offers a strong diagnostic power, so it should be widely implemented into clinical practice. Further studies on a larger number of patients should be done to support the data of this work. 1. Huwart L, Peeters F, Sinkus R, et al. Liver fibrosis: Non-invasive assessment with MR elastography. NMR Biomed 2006:19;173-9. 2. Ophir J, Céspedes I, Ponnekanti H, et al. Elastography: A quantitative method for imaging the elasticity of biological tissues. Ultrason Imaging 1991:13;111-34. 3. Ophir J, Garra B, Kallel F, et al. Elastographic imaging. Ultrasound Med Biol 2000:26 Suppl 1;S23-9. 4. Alam F, Naito K, Horiguchi J, et al. Accuracy of sonographic elastography in the differential diagnosis of enlarged cervical lymph nodes: Comparison with conventional B-mode sonography. AJR Am J Roentgenol 2008:191;604-10. 5. Furukawa MK, Kubota A, Hanamura H, et al. Clinical application of real-time tissue elastography to head and neck cancer - Evaluation of cervical lymph node metastasis with real-time tissue elastography. Nihon Jibiinkoka Gakkai Kaiho 2007:110;503-5. 6. Zhang Y, Qing LV, Yin Y, et al. The value of ultrasound elastography in differential diagnosis of superficial lymph nodes. Front Med China 2009:3;368-74. 7. Rubaltelli L, Stramare R, Tregnaghi A, et al. The role of sonoelastography in the differential diagnosis of neck nodules. J Ultrasound 2009;12:93-100. 8. Choi JJ, Kang BJ, Kim SH, et al. Role of sonographic elastography in the differential diagnosis of axillary lymph nodes in breast cancer. J Ultrasound Med 2011:30;429-36. 9. Teng DK, Wang H, Lin YQ, et al. Value of ultrasound elastography in assessment of enlarged cervical lymph nodes. Asian Pac J Cancer Prev 2012:13;2081-5. 10. Leboulleux S, Girard E, Rose M, et al. Ultrasound criteria of malignancy for cervical lymph nodes in patients followed up for differentiated thyroid cancer. J Clin Endocrinol Metab 2007:92;3590-4. 11. Ying M, Ahuja A, Brook F, et al. Ultrasound evaluation of neck lymph nodes. Australas Soc Ultrasound Med 2003:6;9-17.